Hello there my dears. A couple of posts ago when I wrote about what I’ve been up to I deliberately missed out the most exiting thing that happened to me. I went to a Derren Brown live show. It was INCREDIBLE! If you have been living in a cave or have an objection to Channel 4 or something and you don’t know who Derren Brown is then allow me to explain. He is an amazing magician / illusionist / mind reader. Plus he’s really good at painting. And instead of saying cheese on toast he calls it toast under cheese. Genius! Derren Brown is not just a man who performs tricks, he is so much more. He’s incredibly deep and meaningful in what he does. His last televised series was 4 specials called the Experiments. He looked at luck and crowd anonymity and he convinced a man he’d killed someone. Oh and he got someone to kill Stephen Fry. Not really, Stephen Fry’s fine. Fake gun and blood packs. But there was this audience who thought he’d been killed. If you want to check it out they’re all on 4od. The show I went to see was called Svengali and it was AMAZING!!! I won’t give anything away though because he asked us not to. I’m too devoted to dis obey him. At one point he got a bit he was doing wrong. It’s not his fault it’s the human race’s fault for not having arms that reach to their feet. I think that’s great though because it proves that he’s not using actors or anything. 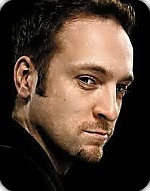 Derren Brown has also written two books called Tricks of the Mind and Confessions of a Conjuror. The latter is my favorite as it’s like an autobiography. I went with a friend which made the experience even more fun. We went on the train together. Awesome! The night I saw a Derren Brown live show was possibly the best night of my life, even the night I was born (that was just messy and painful for everyone). I have vowed that I will see another Derren Brown show even if I’m old and manky. Unless he stops doing them, then I will cry. So that is my Derren Brown experience. He’s so awesome it hurts. If you haven’t seen any of his shows then do! Now! September 4, 2012. Reviews, Stuff we love. 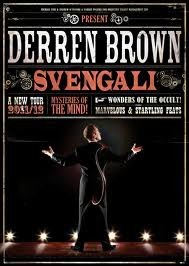 Svengali was on TV a few nights ago, may still be on 4OD… http://www.channel4.com/programmes/derren-brown-the-specials/episode-guide/series-13/episode-1 – Oh, looks like its a new SERIES, Wow! Some bits, I’d liken to Paul Daniels “chair trick”, in that it seems like hypnosis, but there is no “induction”. September 21, 2012 at 12:11 pm. Permalink.